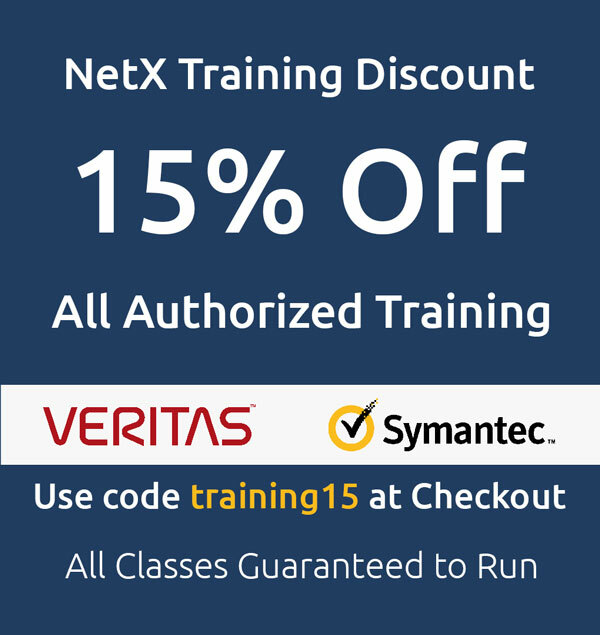 Symantec Veritas Support | NetX Information Systems Inc. Virtual Academy classes for Symantec and Veritas are a unique combination of interactive, live components and self-paced learning technologies. For dispersed teams or employees unable to travel, Virtual Academy for Symantec and Veritas is a comprehensive training option that maximizes the value of your Symantec and Veritas software and ensures best practices in your IT organization. Combining multiple live training tools with self-paced training to recreate the classroom experience, Virtual Academy is the right training solution — wherever your teams are located. Interactive Live Webcasts: During scheduled Webcasts, communicate directly with your Symantec and Veritas instructor, attend Q&A sessions, and experience live navigation of Symantec and Veritas software. Practical Hands-on Labs: You’ll remotely access live Symantec and Veritas systems, and benefit from thorough, real-world experience as you practice what you’ve learned in an authentic, hand-on setting. Expert Mentoring Support: Access your instructor’s expertise with private one-on-one sessions. are available in a variety of multimedia formats — 24 hours a day 7 days a week. Save Time with the Convenience of eLearning — Save valuable time by training IT members across multiple sites at their own workstations. Save on Travel Costs — Expertly train every member of your IT team, without travel costs. Stay Current and Confident — Access a pool of Symantec and Veritas experts with deep, real-world product knowledge. Maximize Efficiency — Get your team up-to-speed quickly with training designed by experienced Symantec and Veritas engineering, product development and technical support experts. Gain Peace of Mind — Know your teams are prepared to handle any situation effectively and to respond efficiently to real-world situations with a Veritas course or Symantec training course.